Check back here regularly as project dates are still being planned. 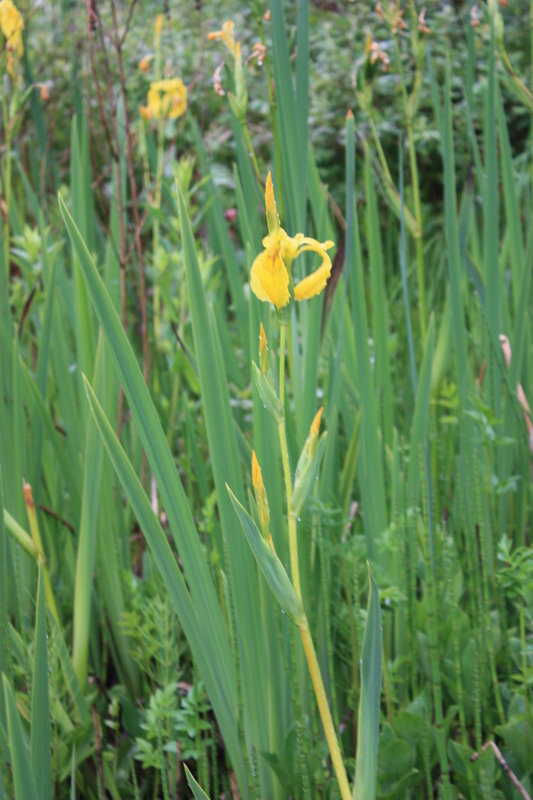 Join steward/biologist, Greg Ferguson and myself to do an invasive pull of the “lovely but lethal” Flag Iris. OK, it’s not lethal, but it is really not good either. We will not totally remove it, but leave a fringe boundary that will stop people or dogs from going in, and still delay it’s gradual taking over the place. Greg is the steward with Stanley Park Ecology Society, and runs the invasive plant management program in Stanley Park. He is a great source of knowledge for learning about the eco-system of our little pond. I have a limited # of hip waders and pitchforks, please RSVP under comments to reserve a spot, rubber boots recommended. This is not recommended as a child friendly activity, but cheering us from the side-lines encouraged! 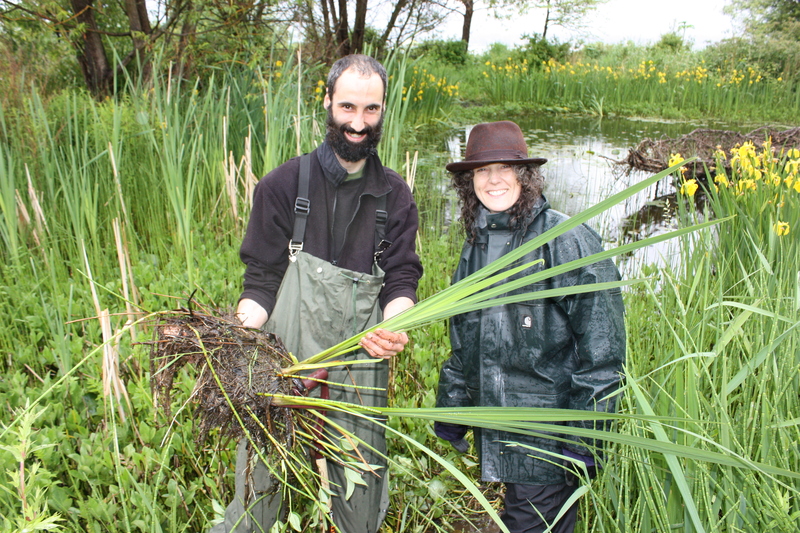 Thanks to Stanley Park Ecology Society for the use of tools and hip waders. "never turn down a chance to wear hip-waders..."
I have done the briefest of braid/weave sample-experiments– enough to determine that some really interesting things can be done with this as a material to create a temporary installation of some sort… I will be working under the pavilion or by the side of the pond these afternoons and hope you can join me in a process of material discovery. During the National Aboriginal Day weekend celebrations at the newly renovated park I will be weaving the last of the pulled Flag Iris with community, and showcase some of the examples made the days prior. Community Activist, and park founder Don Larson (Crab Park Water for Life Society) has for years planned celebrations with music and food in the park. This year, Don and I will co-lead a walking tour of the park history, ecology and various memorials and art works during the event, the tour will begin at approx. 1.45pm by the marsh pond. 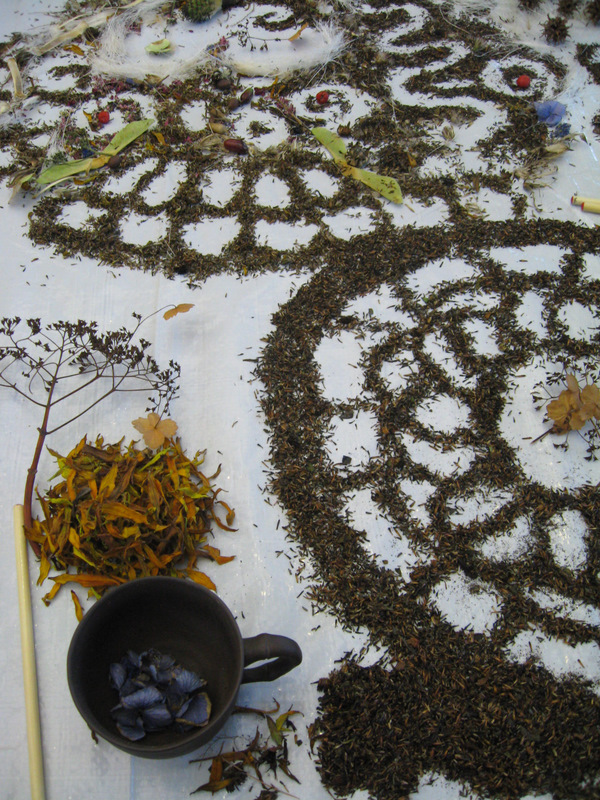 Making a seasonal table mosaic with DEWC patrons. 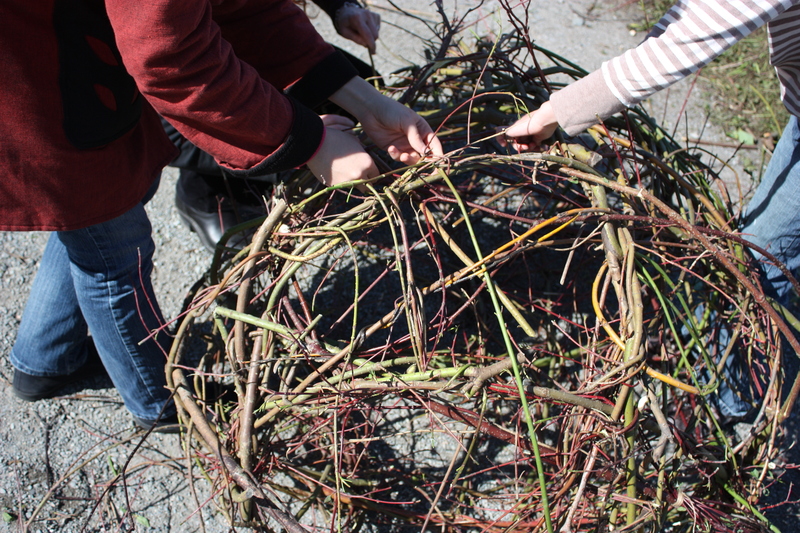 Wednesday, 18th- 1-6pmWeaving a protective border for the Missing Womens’ Memorial Stone. I am very honoured to be partnering with Dalannah Gail Bowen and the Downtown Eastside Arts Centre for this component of the project. There will be tea, cookies and fruit for participants. join in for tea, a walking tour and interactive music with the Legion Of Flying Monkeys Horn Orchestra. hello sharon, we met at the ewma workshop you gave, and i wanted to thank you so much for opening up the door to new materials. being rather reclusive i miss out on a lot of events, would have loved to work with you again at inter-urban, (yes, dalannah is an awe inspiring woman), but had previous health related committments so could not attend. however, will definitely be there for the 29th tea, music and walking tour. i have been mentioning your project to everbody i meet. again, thank you so, so much for the workshop and looking forward to the party.